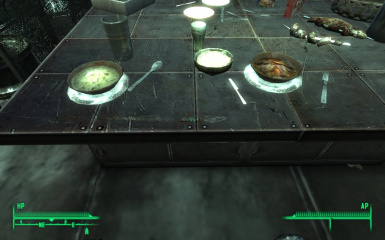 A mod adding new foods and cooking recipies to the Wasteland. 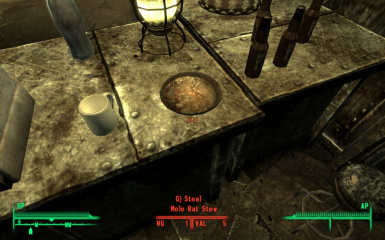 Fallout Food adds the ability to use the pots, pans, and other random items of Pre War cooking paraphenalia to cook the mutated animals and plants of the Wastelands. 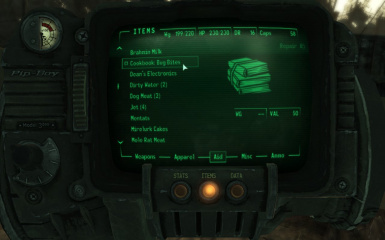 There are twelve cookbooks in the Wastelands, the Pitt, and Point Lookout; Moira and Margaret Primrose each sell the same three, Gary in Rivet City sells three, Panada and Haley in PL each sell the same one, a starter cookbook has been placed the houses in Megaton and Tenpenny, and there are five unique cookbooks placed in special locations. Cookbooks are placed in the Aid menu, and must be activated to use. Like a workbench, this brings up a menu that allows you to choose what you will craft, as well as adding a list of ingredients to your Notes on the first use. All recipes require a Hot Plate, and may require other items depending on complexity. 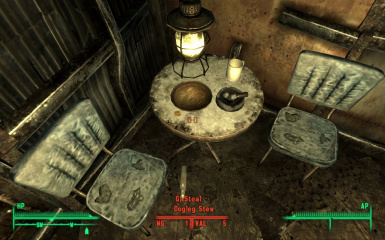 Empty bottles, cups, shot glasses and pitchers may be filled at sinks and water fountains, and when consumed add an empty bottle to the player's inventory to be used again. There is now a 'Fill All' option as well. There are now milk pasteurizers located at Craterside Supply, The Brass Lantern, the restraunt in Tenpenny, and the Galley in Rivet City. 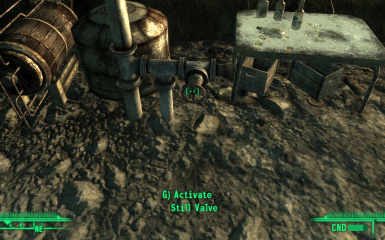 Just pick up an empty milk bottle, insert 4 caps, and activate the device for a nice, rad cleansing bottle of brahmin milk. 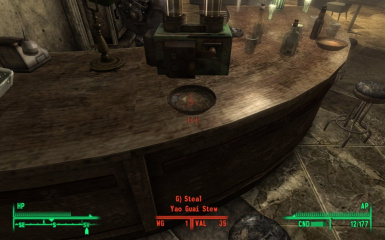 Moriarty has installed a still behind and underneath the bar in Megaton. Use the still with an empty whiskey bottle, large whiskey bottle, or shot glass in inventory to receive a dose of Moriarty's special, Everglow. 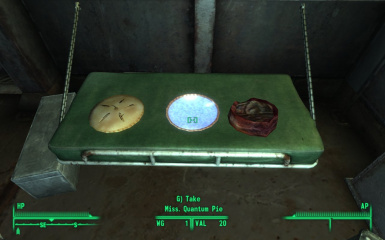 All new foods should be effected by the Food Purifier, and those who have the Lead Belly perk should notice a drop in rads from any of the new waters added by Fallout Food. Also, those with the Cannibal perk should be able to harvest human flesh when they devour a corpse, and will notice increased health from eating any cannibalistic recipies. The base values of human flesh were toned down for the non cannibal. (Slop from the Pitt counts as cannibalistic food, although it adds Action Points for its bonus, instead of health). NukaCola machines have been set to respawn, and look for a special machine in the Nuka Cola HQ. Radscorps now carry 'prey' food, and may have different kinds of meat on them. Molerats now have a chance to carry mutfruit that they haven't eaten yet. Giant Ants may also carry mutroot. Mutfruit plants have begun sprouting in the Wasteland! They may also yield mutroot occasionally when harvested, and should regrow after three days. Also, working grills have been placed around Point Lookout and the Wastelands.These may be used to cook the 'basic' Fallout type foods. Please note, this mod was originally designed for personal use, and some items have been modified to suit my own tastes. Extract the archive to your Fallout 3 Data folder. All files should (theoretically) go where they belong. I may be reached at the Bethesda forums as Coleen. 1.1: Bugfixes and new textures added. 1.2: More bugfixes, some tweaks, and three new meshes/textures added. 1.3 Added support for Point Lookout and the Pitt, and a new cookbook for each. 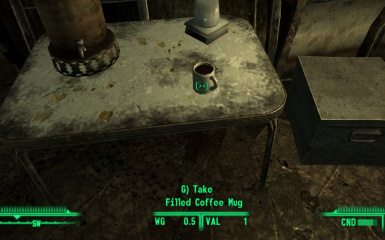 1.4 Added water purifiers in Megaton, Tenpenny Towers, Cantebury Commons, and Rivet City. Started populating the Wasteland with Mutfruit plants. Added a 'Fill All' for water bottles. 1.5 Added a new cookbook, recipe, and tins of coffee for making espresso. This mod is free to modify and use. Please give credit where credit is due when using assets from this mod in other releases. The Fallout 3 community for inspiration as well as help and advice.